History beckons Saturday for George Mason. The last time the Patriots lost four straight CAA home games was 1994-95 under Paul Westhead. Certainly didn't take long for head coach Paul Hewitt to be compared to another George Mason head coach with the same first name. However former Mason head coach Paul Westhead is not someone any coach would want to be compared at when talking about his work in Fairfax. Westhead had a run-and-gun style that did not succeed with Mason like it did during his time at Loyola Marymount. Basically you took as many shots as possible and didn't play any defense [insert joke about Hewitt's "system" being similar]. Westhead's record at George Mason was 38-70. 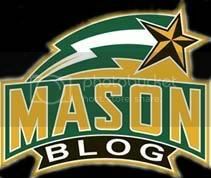 Older Mason fans cringe at the thought of the "Paul Ball" years. Let's hope Hewitt isn't going down this path.